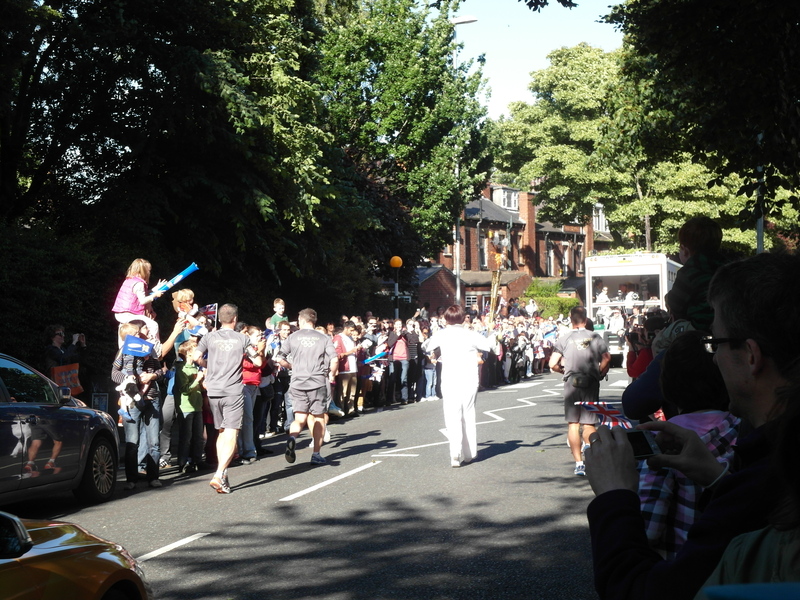 The Olympic torch was carried down my road in Headingley, Leeds on Sunday. I have next to no interest in sport, but the Queen’s recent Diamond Jubilee celebrations reminded me that although I similarly have very little interest in the royal family per se, I am fantastically interested in rituals, commemorations and what they reveal about our collective interests and priorities. So, on the same basis, I turned out to see the torch go by. There’s been some interesting debate recently about the particular ritual of the Olympic torch relay. Mary Beard has been pointing out since the run-up to the Beijing games in 2008 that this ritual was invented by Hitler, and using that fact to support her view that it is silly, a waste of money and should be dropped. Since then, other commentators have picked up Mary’s point and she herself has regularly reiterated it. But all traditions have to be invented at some point, as Mary well knows, and they also change and evolve in response to contemporary needs. My colleague Elizabeth Pender is working on the ideals and values associated with the Olympic games at the moment, and pointed out to me over lunch recently the huge contrasts between the way the Chinese used the torch-carrying ritual four years ago for the Beijing Olympics and the way the UK is using it now. As she said, the Chinese approach was distinctly imperialistic. They sent it all around the globe, on the longest route it had ever followed – an instant claim to Chinese pre-eminence. The torch-bearers were Chinese athletes and other notable cultural figures (actors, musicians, directors etc), making the relay into a display of the physical prowess and cultural achievements of their people, while of course they famously ran surrounded by uniformed security guards – an unmistakeable symbol of China’s strength, discipline and ability to suppress dissent. And all of this provoked considerable controversies along the route, as the torch-relay became the focus of protests against China’s human rights record, anger with the heavy-handed security guards, and a general sense from commentators that this wasn’t quite in keeping with the supposedly peaceful, non-political ideology of the Olympic games. That’s the context in which Mary Beard first started voicing her opposition to the torch relay, and in the face of that particular iteration of it I can see her point. The claims to national pre-eminence inherent in the Chinese rally certainly bear close comparison with the ceremony invented by the Third Reich. But the way the relay has been used in the UK this year is a vivid example of just how flexible and adaptable rituals like this can be. Here, the torch relay has explicitly and deliberately been used to foster and demonstrate localism and inclusiveness, on an entirely internal stage. Far from travelling round the globe, this year’s torch is being taken instead into the heart of as many communities across the UK as possible. The 8000-mile route has apparently been designed to pass within an hour’s journey or less from 95% of the population, so that there are actually huge numbers of people (including Mary Beard) having the same experience as me – of the torch going down their very own road. At that point, no matter how little interest you have, it becomes churlish to sit inside deliberately not looking out of the window – and so you get sucked in in spite of yourself, included in the whole experience, and drawn together with your immediate neighbours and fellow citizens across the country. 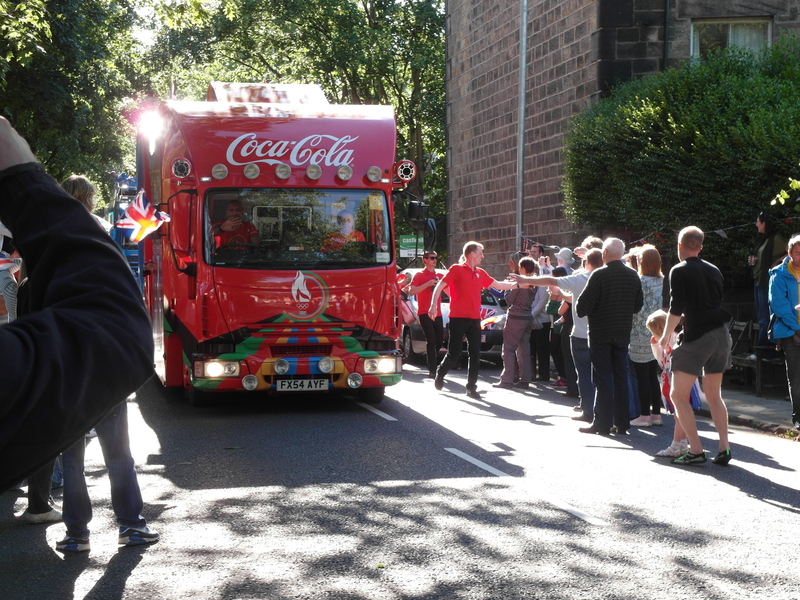 The torch-bearers are local people, too – out of 8000 in total, 700 are athletes, but the other 7300 have been put forward by their local communities and chosen on the basis of their personal achievements and / or contribution to the area. And this has been really effective. I’ve heard very little criticism of this particular form of Olympic torch relay, but instead all sorts of heart-warming local news stories showing the torch being photographed at distinctive local landmarks and people turning out to cheer and enjoy the atmosphere as it goes by. Nonetheless, the “don’t you know the torch relay was invented by Hitler?” meme itself remains very much alive. In fact, it seems to have become this year’s torch-relay comment piece de rigeur. And I am pleased to see this sort of conversation about the relay going on. The discourse which rituals like this provoke, whether anti or pro, is to me all part of their wider cultural value – and of course we should always think to ask where our traditions come from, and what that adds to or detracts from their value, as part of the ongoing process of deciding whether or not we want to perpetuate them. I think this particular response to the torch relay, though, also reveals a distinct measure of what I think of as ‘ritual anxiety’ – that is, an uneasiness around the whole idea of ritual activities. It’s something I see in relation to all sorts of other ritual occasions and commemorative events, and particularly strikes me on Valentine’s Day, when a whole army of people emerge every year to complain that we shouldn’t need a special day devoted to something we should be doing all the time, that it is meaningless, too commercialised, misogynistic etc. But it also crops up in relation to Christmas (goods in the shops too early, probably not really the date of the historical Jesus’ birth), Easter (it’s a pagan festival really!, no it’s not), and almost any other ritual or commemorative occasion you can name. A lot of this sort of commentary seems to spring from discomfort with the arbitrary, invented character of these events. We are asked to treat a particular day as special when we know that it isn’t really inherently different from any other day, or to take particular actions and rituals seriously when we know full well that they don’t have any concrete outcome – and indeed that someone just like us simply invented them at some point. None of that sits well with a modern mind-set that demands rational grounds for doing things. Then, of course, there is our awareness that rituals of all kinds have a long history of being used by repressive regimes, ideologies and religions as tools for boosting their own prestige and indoctrinating cowed and ill-educated populations into their preferred ways of thinking. That certainly doesn’t look palatable to the populations of modern liberal democracies, and is exactly what the ‘invented-by-Hitler’ meme conjures up. But sometimes I think that the modern urge to respond cynically and suspiciously to rituals risks underestimating their social and emotive value, as well as the ways in which they can be re-appropriated by the masses of ordinary people participating in them. Few people in the UK are really so severely rationalistic as to eschew Christmas altogether, even if we don’t believe in its religious symbolism, or indeed belong to another religious tradition altogether. In the end, most people recognise that it’s a good excuse to connect with other people via a common experience and have a bit of fun, and that there is enough flexibility in the festival to access those parts of it separately from its religious content. In fact, Christmas is a very good example of a festival which has been widely re-appropriated, and is now as much a secular festival celebrated out of generalised nostalgia for the past (Victorian Britain, pagan midwinter festivals or whatever) and for the sake of present-day shared identity, as it is a religious one. Similarly, with the Olympic torch relay, arguably what is more important than the invention of the ritual under the Nazis is the choice that was made to repeat it for the next Olympic games, held in London in 1948. It was at that point, in fact, and not in 1936, that it became a tradition rather than just a one-off event – and also that the London Olympic organisers established it as a flexible ritual, which did not have to be celebrated in the same way every four years. That is re-appropriation, and to me already renders the actual origins of the relay rather insignificant – and that is to say nothing of the constant re-invention and re-working of the ritual which has continued unabated over the subsequent 64 years. 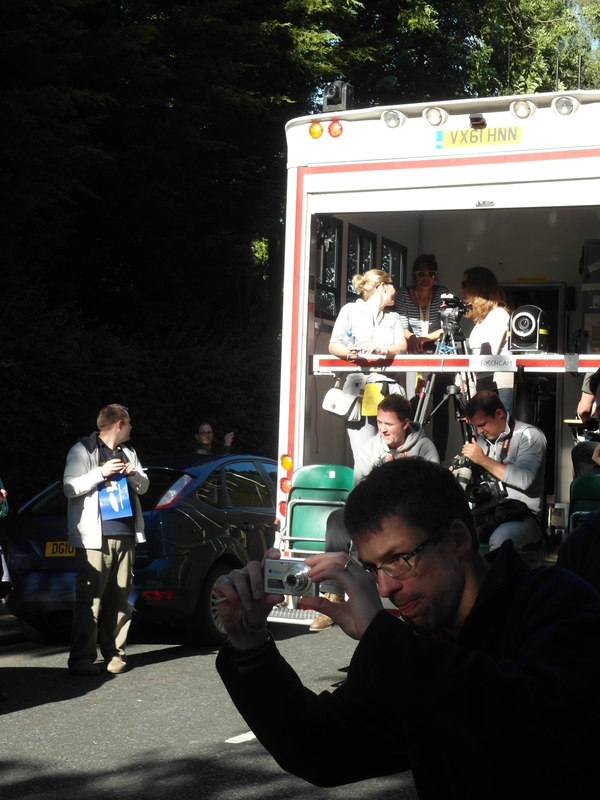 Meanwhile, in Leeds the torch relay has been quite an event. The City Council and local newspapers have been busy promoting it, as have local businesses and organisations. When the torch arrived in Headingley itself, it called in first at the area’s best-known landmark – the Carnegie Stadium, which is home to both the Leeds Rhinos rugby club and Yorkshire County Cricket Club, and where it was greeted by local MP Greg Mulholland. There was a big rugby game on at the stadium anyway, so taking the torch there was clearly a good way to involve lots of people in the relay. But the management also opened up the gates for free entry while the torch passed through, and stated explicitly on their website that “Headingley Carnegie Stadium are looking forward to extending a special welcome to families who’ve never been to the ground before.” So for them it was an opportunity to draw people in to an aspect of Headingley life which they might not previously have been involved with before – presumably with the hope that they would like it and come again. I didn’t think very many people would be watching on my road itself, assuming that surely most people would go to see it in the stadium or along the main shopping street instead, but boy was I wrong! 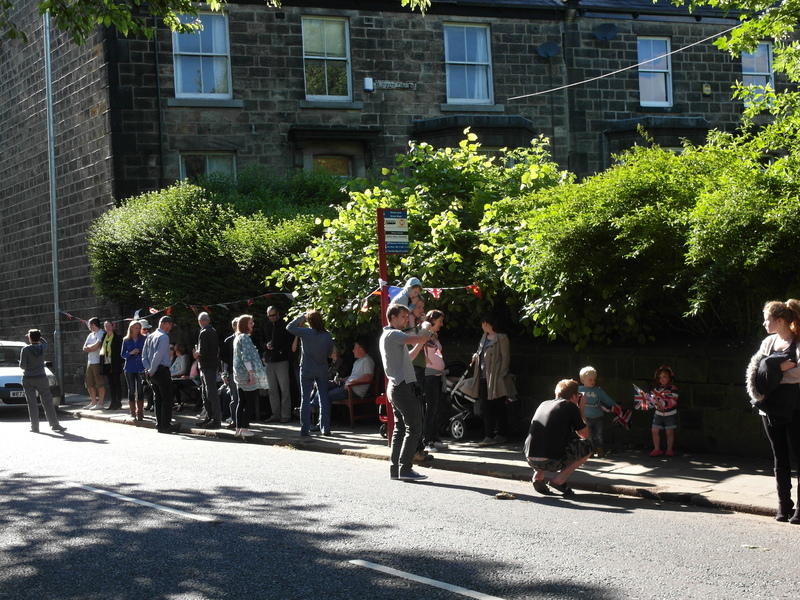 I could tell things were gearing up from about an hour before the torch arrived, when I looked out of the window and saw a lady living opposite hanging out some bunting, and by half an hour before the torch came past there were already rows of people lining what is normally a fairly quiet suburban road. At that point I got out there and started taking a few photos and chatting to people, and you could really feel a sense of palpable excitement along the street. 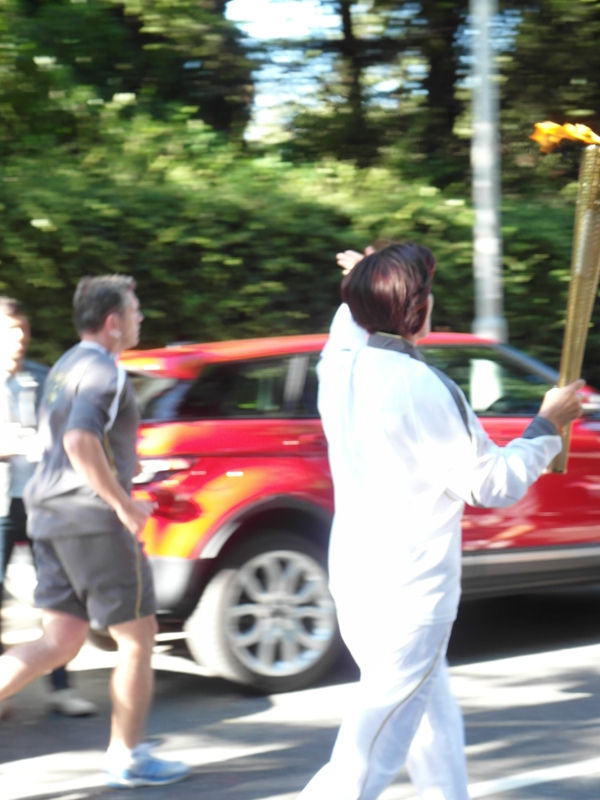 The chap standing next to me had walked down from Far Headingley with his slightly reluctant son (who would rather have watched it on TV), and was keen to point out that we would never get the chance to see an Olympic torch relay going through our area in real life again. In other words, he wanted to feel that he was an active participant in a unique moment of our communal history – which seems also to have been one of the main attractions of the Diamond Jubilee. By the time the torch came by, the son was looking just as interested and excited as everyone else. There were of course plenty of people there to promote their businesses or make money out of the crowds, from big Coca-Cola, Samsung and Lloyds TSB floats with blaring music and cheer-leaders to a lady selling Union Jack (yes, I know) flags and a local ice-cream van which turned up towards the end. But hey, that’s all part of our society too. 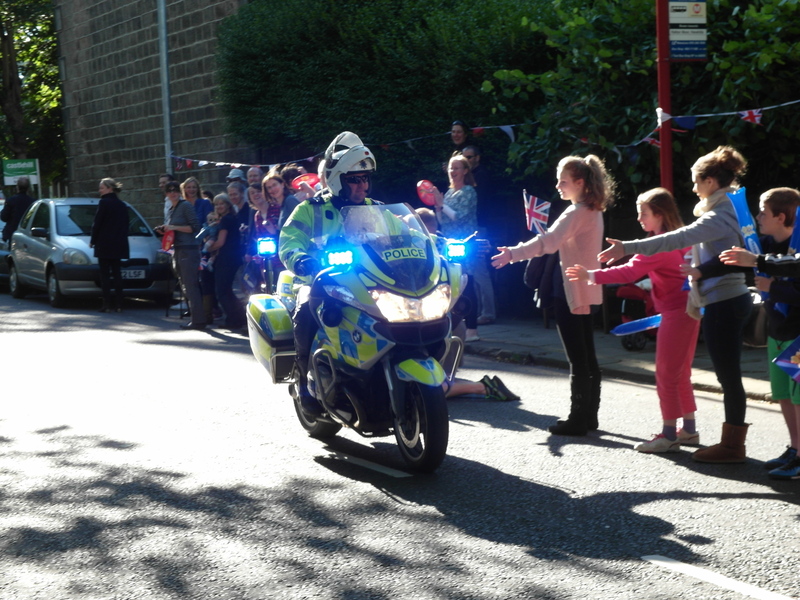 And meanwhile there was some surprisingly touching camaraderie – like the police motorbike riders, who were technically there to clear the crowds gently out of the path of the procession, mainly spending their time cruising past and high-fiving everyone. I know it’s a huge cliché, but I took the opportunity to get chatting to my next-door neighbours, who moved in a couple of months ago but whom I hadn’t spoken to yet – and of course found that they were lovely people whom I was really pleased to get to know. 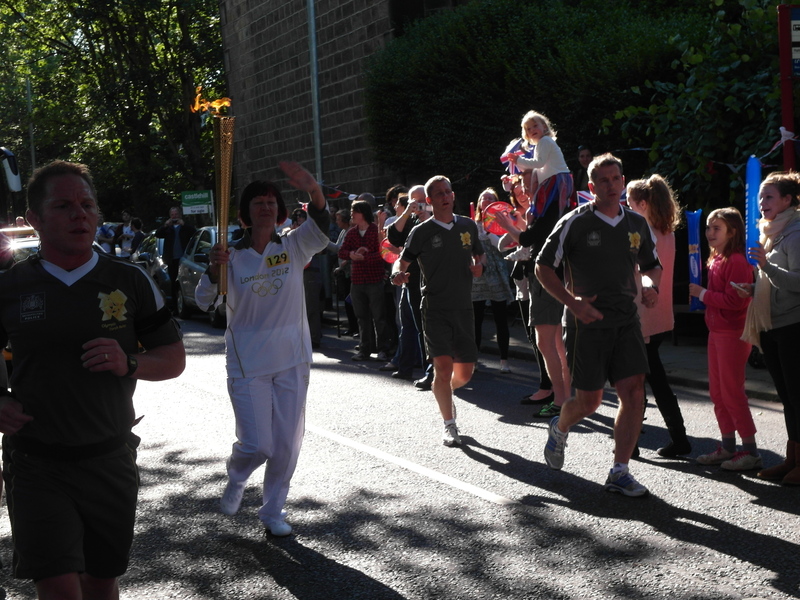 The torch-bearer along my stretch was Susan Marley, who has campaigned extensively for cystic fibrosis research. I could tell it was her because she was the only woman out of five torch-bearers for the Headingley route – which, given that these people were put forward by their local community, is a bit disappointing, actually. Don’t the people of Headingley feel that more of their women are worth celebrating? Still, I was pleased to cheer her on, and she looked like she was really enjoying her well-deserved moment in the spotlight. The actual passage of the torch was incredibly quick in comparison to the time spent waiting for it, of course. But the real attraction was never the torch itself anyway. 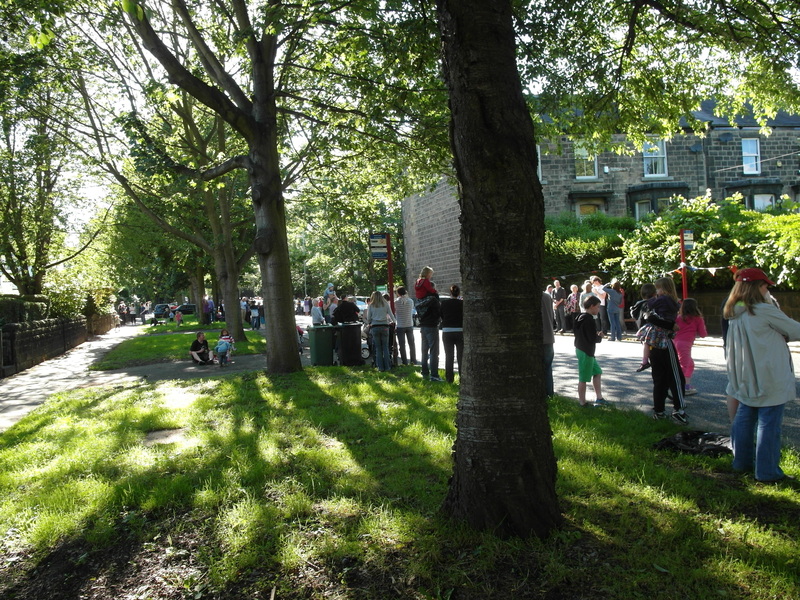 It was the sense of being part of a something exciting with nationwide resonances, but happening right outside my house and involving my own local community – just as the organisers had always designed it to be. I’m glad the torch relay provided a focus for that, I’m glad I took part – and I don’t think that the connection with the Third Reich detracted from it. What I saw showed me that the ritual has transcended its origins – and that taking part in something which doesn’t stand up to rational scrutiny can still be really enjoyable and worthwhile. If you live in Leeds and would like to know more about the relationship between the ancient and modern Olympics, my colleagues Emma Stafford and Elizabeth Pender will be giving lunchtime talks on that subject on Thursday 28th June and Thursday 26th July as part of the Classics in our lunchtimes series at Leeds City Museum. Both are free to attend, and details of the first talk, on ‘Olympic Beginnings: preparing for the Games, then and now’ are available here. If you can’t make it to the talks themselves, you can listen to them afterwards as part of the Classics in our lunchtimes podcast series. We’re going back a looong way here, to something which I actually did in late February. I half-wrote it up at the time, but then it got lost under a pile of other things and never posted. The Jubilee weekend finally gave me the time to finish the job. Thursday February 23rd was the date of the Roman Terminalia, the annual festival of Terminus, who was the god of boundaries. 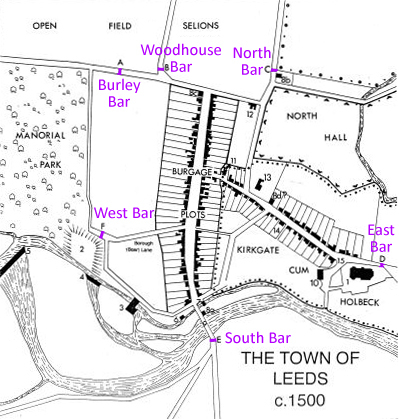 A Leeds-based group of psychogeographers had decided to celebrate it by walking around the circuit of bar stones which marked the medieval / early modern city boundaries, and I went along to join them. Psychogeography is all about experiencing (mainly urban) landscapes from a personal, emotional and sensory perspective. It looks for a subjective geography of the city, informed by an individual viewer’s memories, experiences and associations, and actively sets out to explore urban landscapes in unusual ways in order to bring out ways of relating to urban space which most of us miss in the rush of day-to-day living. So I think that for most people in the group, the walk was a way of experiencing Leeds’ past and present urban landscape in a different way, helping them to see it and engage with it from an unusual angle, and particularly prompting thoughts about the many different kinds of boundaries – both physical and conceptual – which exist in our cities today. I was interested enough in the psychogeographical side of the experience – I am both a scholar of urban space and an interested resident of Leeds after all. But linking it with the Roman Terminalia was the absolute the icing on the cake from my perspective. And it’s not just that that lent a Classical veneer to what would otherwise have been an interesting walk around the city centre anyway. It’s that I have specifically conducted research into and published work on Roman urban boundaries – it’s covered briefly in chapter 3 of my book, and a fuller paper on the topic will hopefully come out some time in the next 18 months. So for me, this walk was a way of experiencing for myself a reworked version of the religious practices which surrounded those boundaries in the Roman era, and perhaps achieving a better understanding of what boundaries meant in the Roman world as a result. It was like the subject of my research coming to life and manifesting itself in my own city. Basically, this event couldn’t have been more Relevant To My Interests unless perhaps we had done the walk all dressed up as characters from Doctor Who. The fullest description of the Roman Terminalia is given by Ovid at Fasti 2.639-84, although references to rites in honour of Terminus specifically, and other religious rituals connected with boundaries more generally, crop up in a number of other sources too. Marking and commemorating boundaries seems to have quite an obsession with the Romans, in fact – and that is hardly surprising. Boundaries are fundamental to so many things – property rights, security, territorial control, spheres of power and privilege, social identities, and basic practical categorisations and definitions. In a polytheistic society it would be odd if they were not the objects of religious ritual – especially given that in many cases, religious sanction was their primary practical guarantor. In a world where few people had access to effective legal protection or redress, the religious authority of boundaries must have been the main thing which made people respect them, and thus also the fields, territories, concepts or spheres of social action which they defined. Indeed, although records showing the courses of physical boundaries clearly existed (see e.g. Tacitus on public documents showing the course of the pomerium at Rome), in a semi-literate society, annual ceremonies in which people physically went to their boundaries, observed where they ran and made offerings in their honour would also have been a very effective way of keeping them ‘alive’, and stopping them from being forgotten or ignored. Ovid’s account of the Terminalia focuses mainly on the rituals carried out by ordinary farming families, marking and celebrating the boundaries between their own and their neighbour’s properties. He describes the offerings of garlands, cakes, grain, honeycombs, wine and sacrificial animals which they make at the boundary markers – but refers also to Terminus’ much wider remit, guaranteeing the boundaries of cities and kingdoms too, and ensuring peace between the peoples on either side. Ovid also mentions the public sacrifice of a sheep carried out on the same day at a shrine of Terminus which stood at the sixth milestone out from Rome along the via Laurentia. This shrine in itself was important because it was believed to mark one of the places where the boundary of the original rural territory controlled by archaic Rome intersected with the roads leading out from it. It was one of a series of similar places around the fifth or sixth milestones of some of the other roads which did the same job, and, according to Strabo (Geography 5.3.2), all received sacrifices on the same day as a means of marking and commemorating the boundary. It’s unclear whether circular processions ever linked these shrines to form a huge ceremonial ring around the city, or whether the boundaries of the city of Rome received the same treatment on an annual basis either. We have references to ad hoc circular processions around the urban boundaries at times of threat – for example, one described by Lucan (1.592 ff = 1.642 ff. in this translation) which was supposedly undertaken while Caesar marched towards Rome in 49 BC, or another in the Historia Augusta (Aurelian 18-20) carried out during the Marcomannic wars of the AD 270s, when the Romans suddenly came face to face with the real possibility of a barbarian sack for the first time in several centuries. It’s also quite possible that the routes followed by the runners in the Lupercalia, and the procession in a triumph, were connected with the supposed original boundary of the city of Rome, believed to have been marked out by Romulus. But there doesn’t actually seem to have been an official annual beating-the-bounds style ceremony around Rome’s urban boundaries, as far as we know. Still, Leeds was never a Roman city anyway, so I’m pretty sure we can do whatever we like – including reinterpreting ancient Roman religious ceremonies to suit our own needs and interests.